Some villains are so well cast, you wish they had a movie all to their lonesome so you could eat yer popcorn and drool over their nastiness, without any screen-time hogging heroes to get in their way. Heath Ledger - Joker, Michelle Pfeiffer - Catwoman, Ian McKellen - Magneto, and in 2011 Hugo Weaving - The Red Skull. 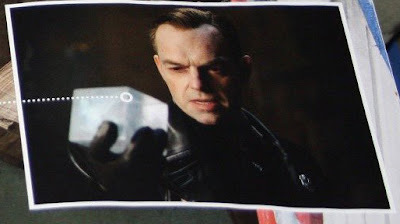 Probably the last blog on earth to post this sweet concept art and scanned press photo of Weaving in full skull-duggery (inc Cosmic Cube) from the upcoming flick Captain America: The First Avenger, but sue me - this pairing is worth it. Oscar man - you're on in five. How sweet is that image. I think I'm stealing that one Dan. Oh that's gonna be so sweet! But wait...Michelle as Catwoman? I don't think so Dan. Other women played that better. Maybe campier, but definitely better. Two spring to mind. 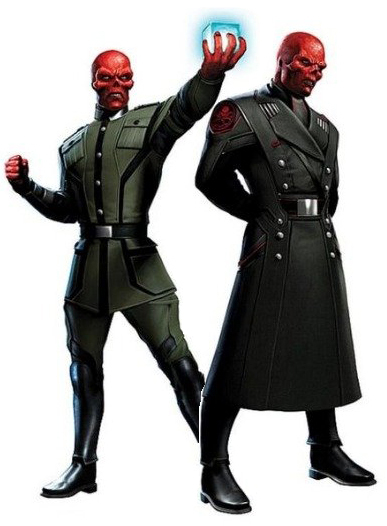 Hugo is the perfect match as Red Skull..So far Cap movie is really building up well. Random - I agree. I like the Animated Catwoman the best though. IFF-I just wish the studio would release a damn trailer or something. Hey folks thanks for all the great comments! IFF and Craig - I'm looking forward to the trailer too. You don't have to hang round IADW long to know I think Cap is pretty awesome - I can't decide though whether they should leave the shield toss for the film.... what do you think? Sorry peeps though - I loved Michelle as Catwoman at still think that is the best. Just please when you say two others played her better Craig, don't tell me you mean one of them was also an X-Man - otherwise I will have no choice but to get someone to wash your mouth out with soap until you repent! Dan, even though you and me are mates (strictly platonic) i gotta join this dog pile on you about Michelle Pfieffer as Catwoman. but then again i hated everything about that movie. it's like with the Star Wars prequels. all bad stuff for the actors's resumes i think. and as you all know i also hate tim burton. i hope they have a 1000 Ways to Die episode about him some day. 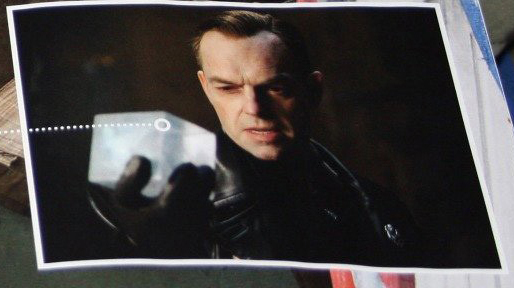 as for Hugo who doesn't love agent Smith and the voice of V and Megatron!? the only thing here is that part of me just wants to see Hugo play good guys from now on even though i know he can pull of playing a bad guy well. think about it, Hugo will be a friggin nazi, oy vey! by the way Dan thanks for your latest comments on my blogs. ...so that's 3 against 1? Trust me Dan, I love my X-men, especially Storm/Halle, but she did for Catwoman what Adam Sandler did for the Son of Satan. That movie was utter crap. I think Random was referring to Julie Newmar and Yzma (I mean Eartha Kitt). I was thinking Adrienne Barbeau voicing her in the Animated Series as my favorite. I will agree with you that Michelle in the goth makeup and leather outfit was pretty damn hot though. oh that's right, i totally forgot about Adrienne Barbeau doing the voice of Catwoman in the Batman cartoon. Adrienne Barbeau is my first celeb crush i can recall. the way she looked in Swamp Thing and Escape from N.Y. in those tattered outfits with the plunging neck line was really something else. those are some of my fondest memories from the 80s for sure. Maybe I should start a Catwoman blog or rebrand IADW! Or at least run a poll until someone else agrees with me - there has to be one! Craig, that is EXACTLY who I was referring to (and points to you for throwing in the Yzma reference. Squeeker!) I was going for live action, but yeah, I'd have to go with the animated series one too and move her above Ms. Kitt, but below Newmar. Sorry. Newmar looked too good in the suit, and played the part too well. Although I will make allowances for the fact that this might just be my idealistic memory playing tricks on me. And yes, Michelle was hot, but she was just Michelle being hot. As for Cap's shield, Dan, I say they need to throw it at least once. They could pull that off, couldn't they? Sure! It would be kinda cool if the movie starts with darkness and a series of thack's building as you finda Hydra soldiers running terrified, and as the last one falls into the water you hear thip and follow the camera up to see Cap reaffixing his shield to his arm. "America is for the free son - not the close minded" stomp!